Don’t get stuck with old school monitoring. Your app going down is annoying. Spending days, or even weeks, searching for the root cause of the problem is frustrating. But knowing it’s also undermining your company's digital transformation is exasperating. It doesn’t have to be this way - Watch the series now! Complex enterprise cloud environments require a completely new approach to monitoring. We recognized this years ago and purpose-built the new Dynatrace platform specifically for today’s hybrid, multi-cloud, microservice architectures. 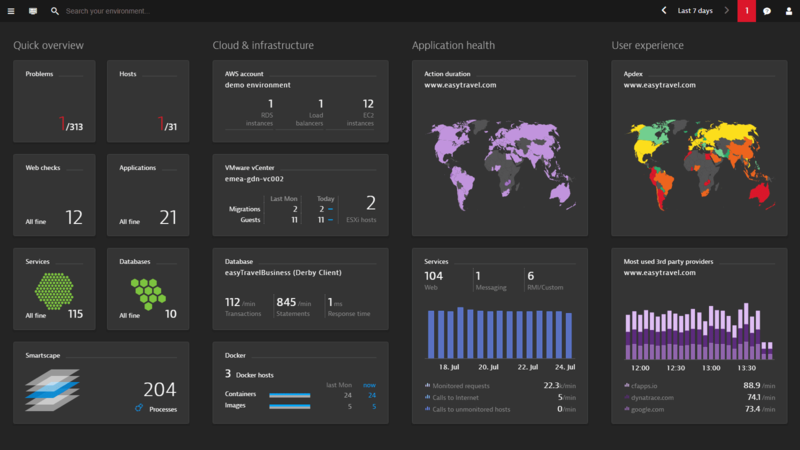 In this series, you’ll see how Dynatrace takes you beyond traditional, gen 2 monitoring into the new multi-cloud, gen 3 world. Fully automated from start to finish... to handle your dynamic infrastructure and complex applications. AI-driven from the core... using the best data and causation-based tech that goes way beyond just correlating time series metrics. All-in-one... so you avoid monitoring tool sprawl and can rely on a simple, single-agent, and full stack approach. Purpose-built for cloud native... scaling to 100,000+ instances and auto-detecting containers and the processes running inside them. Imagine what it could do for your IT Ops. Please send me email updates from Dynatrace LLC and its local subsidiaries, including product developments, industry news, upcoming events, best practice tools, surveys or access to free trials. Ready to see Dynatrace in action? Take a free trial!